Dr. Olson is a licensed clinical psychologist in the Department of Psychiatry. She received her PhD in Clinical Psychology from the University of Kansas. Dr. Olson completed postdoctoral training at Warren Alpert Medical School of Brown University and the University of Wisconsin School of Medicine and Public Health. 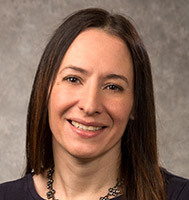 She specializes in treating individuals with anxiety disorders, depression, and obsessive-compulsive disorder using exposure therapy, cognitive-behavioral and mindfulness-based approaches. Dr. Olson's other interests include understanding how memory and learning contribute to anxiety and fear with the aim of improving treatment outcomes.